Who doesn't love a good party? Photo editors Laurie Green, Daniella Nilva-Cunnighman and I sure do! We're at the Rube Goldberg book launch party held at Paul Stuart. The photographer officially took our picture but alas, it didn't make the cut. So here's the selfie! Three openings last night, two at Pace Gallery including a preview of Chuck Close's "Nudes". I've met a few celebrities in my day, but I'm totally freaking out with Marina Abramović and duh, Chuck Close there. I'm such a dork with Chuck Close! One of my clients, bkstyled, held their first workshop a couple weeks ago - "Merry Marbling" - with fashion designer Ilana Kohn. Generally I prefer more controlled shooting to events, but instead saw the marbling event as a reportage opportunity. Sometimes it's good to go out of your comfort zone, no? It was held in Primrose Cafe in Clinton Hill, Brooklyn. In the back room. At night. Dimly lit and small. And low ceilings. No problem. Bouncing a flash onto the ceiling and photographing at ISO 1600, I was able to bleed in a tiny bit of ambient and still retain sharpness. Mixing colors. Emily Grace of Hartland Brooklyn (center). Fox's U-bet chocolate syrup, Brooklyn Brewery Chocolate Stout, Citrus Hella Bitter and bubbly. Sounds odd - tastes goooood. Afterward were cocktails made with Brooklyn Brewery Chocolate Stout, Citrus Hella Bitter, a little U-Bet chocolate syrup and bubbly - surprisingly yummy! Plus Mast Chocolates to snack on and goodie bag. Mast Brothers chocolates to snack on. 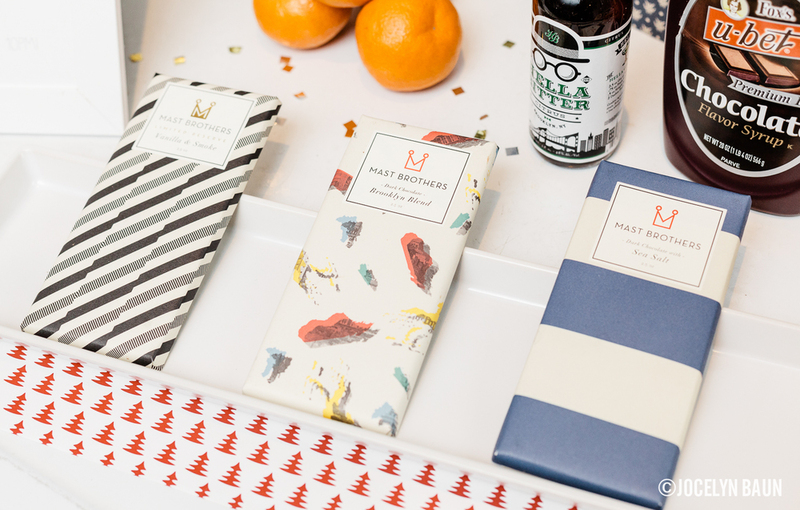 The Claudia Pearson goodie bag included Fox's U-bet chocolate syrup, Cirque nail polish, Knot & Bow parcel tags, a Mast Brothers chocolate bar and a bkstyled fabric notebook. Good times at the bkstyled x Ilana Kohn fabric marbling workshop. And it wasn't all work. I did get to marble a few handkerchiefs! It's here - Open Show NY #9 at the Bronx Documentary Center. Our first themed show! - HOME! We're presenting amazing photography from Brenda Ann Kenneally, Laura Glabman, Nancy Borowick, Sheila Griffin and Smita Sharma. $10 suggested donation supports Bronx Documentary Center and Open Show NY programming. Food and drinks available for purchase. It's Photo Madness Week! I hope you rested over the weekend, because this week is ka-razy with events, including the biggie - PDN Photo Plus Expo and Conference. Here's a list of events to plan out your schedule. PDN Photo Plus Expo and Conference (Oct 23-36): This one is MASSIVE. Like proper, overwhelming conference. Held at the Javits Center, it's gear, seminars, portfolio reviews, lots of SWAG. It's still FREE to register (Expo only) until the 22nd, so get on it! And there's happenings off-site as well like Leica's S-System events at Go Studios. On Tuesday (22nd), AbelCine is hosting Beyond the Frame: Expanding the Language of Journalism Through Motion. VII photojournalists will be discussing how they use video to tell stories. On Saturday (26th) there's the Lucie Lectures featuring Taryn Simon and Ricky Flores. The actual Lucie Awards ceremony is on Sunday at Carnegie Hall. Cocktail/black tie folks! My fellow photographer Lisette Poole is hosting a benefit for Hurricane Sandy victims in Cuba at Videology Bar in Williamsburg. NYC Salt, a digital photography program for underprivileged youth, is having an open house on the 24th, 6-9pm, sponsored by Lexar. Peter Hurley/F-Stoppers Party : Sat, Oct 26 8pm - 12am. This isn't free though - $20, all you can drink and eat. Too much going on! Which events are you going to? If you want to meet up, drop me a line and we'll coordinate. That's right! Open Show NY #8 is this evening. Come check out photo projects from Ilona Szwarc, M. Wesley Ham, Tiana Markova-Gold, Johnny Milano and Joseph Michael Lopez. We'll also have a Q&A with the artists. HINT: get there early to snag a seat and order food. It's gonna be packed! Oh did I mention it's FREE! (not the food or booze though). I'll be at the door checking people in; say hi! Oh no. Here comes trouble - Amy Mayes and I checked out Photoville yesterday afternoon. It's immediately better than last year since they scheduled for Fall (Whew! Last year was in the middle of summer and way too hot to be walking in and out of shipping containers contemplating work - sorry, had to admit it). We started off with the Luminance talk, Bring Your C Game (Creativity) to an Editorial Shoot with RollingStone's Deborah Dragon and photographer Peter Yang. It was a behind the scenes look at some of Peter's celebrity portraits for the magazine. Super nice guy too! Photo exhibits are in the main area. Like last year, each is in shipping container. Prints are held up by magnets. Hip and eco-friendly! There's lots to see, so plan on spending a few hours hanging out, a few shows here, maybe a beer, a couple more shipping containers, maybe another beer and snack. We blazed through, which I really wish I hadn't, but you do what you can, no? I'm off to a wedding this weekend, so can't come back. And don't forget the Fence! Especially my friend Radhika's work Puppies Behind Bars.